Whether its in a small kitchen area or a formal dining room this side chair will be sure to add a sophisticated style to your home. 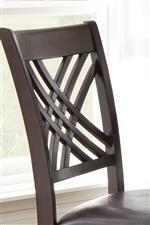 The back of the chair features a unique x motif design that adds character to the piece. The upholstered vinyl seats are comfortable to sit on and are easy to clean in case you have any messy eaters or children. The frame of the chair is made of hardwoods solids and primavera veneers with a Merlot Cherry wood finish that gives it its stately appearance. 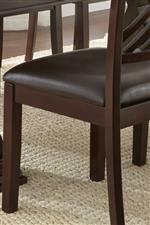 The Adrian X Back and Upholstered Seat Side Chair by Steve Silver at Walker's Furniture in the Spokane, Kennewick, Tri-Cities, Wenatchee, Coeur D’Alene, Yakima, Walla Walla, Umatilla, Moses Lake area. Product availability may vary. Contact us for the most current availability on this product. 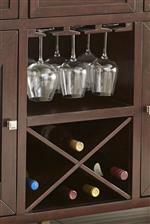 This dining collection provides sophisticated style with simplistic design to create a rich dining experience. Both the chair and table feature an X-motif design that adds charm to both pieces. The chairs contain vinyl upholstered seats that are easy to clean and comfortable to sit on while the table allows you to expand your dining space so you can invite more people to the table for special occasions and large get-togethers. Complete with a server that can hold your wine bottles, glasses, linens and silverware, this dining collection offers a great update for your dining space. The Adrian collection is a great option if you are looking for Transitional furniture in the Spokane, Kennewick, Tri-Cities, Wenatchee, Coeur D’Alene, Yakima, Walla Walla, Umatilla, Moses Lake area. Browse other items in the Adrian collection from Walker's Furniture in the Spokane, Kennewick, Tri-Cities, Wenatchee, Coeur D’Alene, Yakima, Walla Walla, Umatilla, Moses Lake area.